ModernChalkboard.com has a large collections of SMART Board lessons for elementary school teachers. Their Notebook lessons work with SMART Board interactive whiteboard systems and cover a variety of topics. 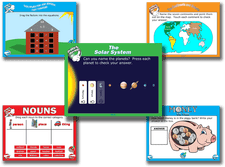 Created by the same team as SuperTeacherWorksheets, ModernChalkboard has tons of resources for teachers looking to energize their SMART Board lessons. There are plenty of interactive math activities on topics that include perimeter, telling time, counting money, and fractions. Electricity, human body, and the solar system are just a few of the science topics you’ll find. ModernChalkboard also includes interactive classroom calendars, social studies topics, grammar lessons, and early literacy. ModernChalkboard is offering two promotions: use the code TWENTY to save $20 on individual memberships or the code SMART for $100 off a school site license membership. You can check out a some of ModernChalkboard’s free SMART Notebook files on their site!